The pipes froze, ruptured, and flooded parts of the master bedroom and family room of this Needham condo unit. It is traumatic enough when a homeowner has to deal with damage to their home. It is unacceptable for them to have to deal with additional damage from your remediation company. 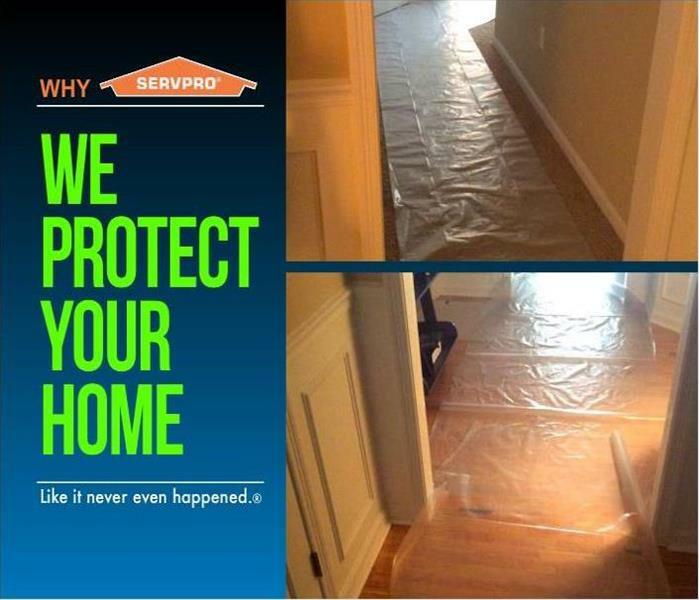 At SERVPRO of Newton / Wellesley our technicians take every precaution necessary, from floor mats and shoe guards to tarps and tents, to ensure that no additional damage occurs to your home. We are not only remediation experts, we are your guests! The roof of an office building in Framingham had a small leak. 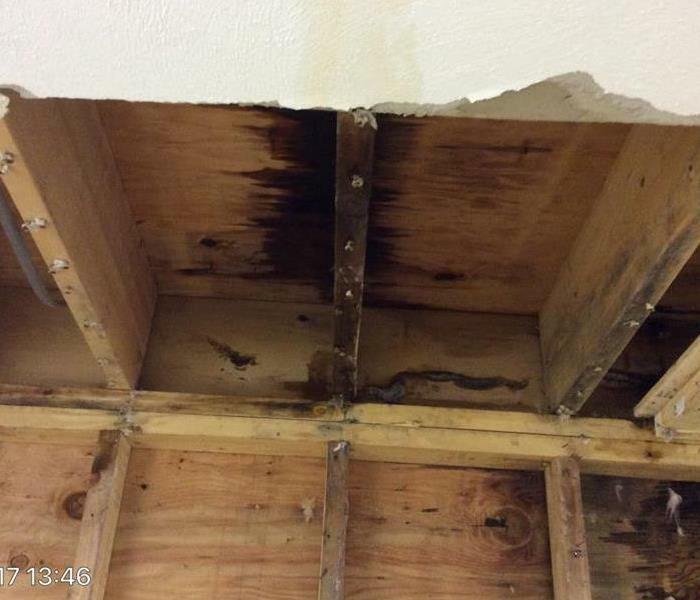 Unfortunately, during a recent storm the small leak flooded thousands of square feet of office space! 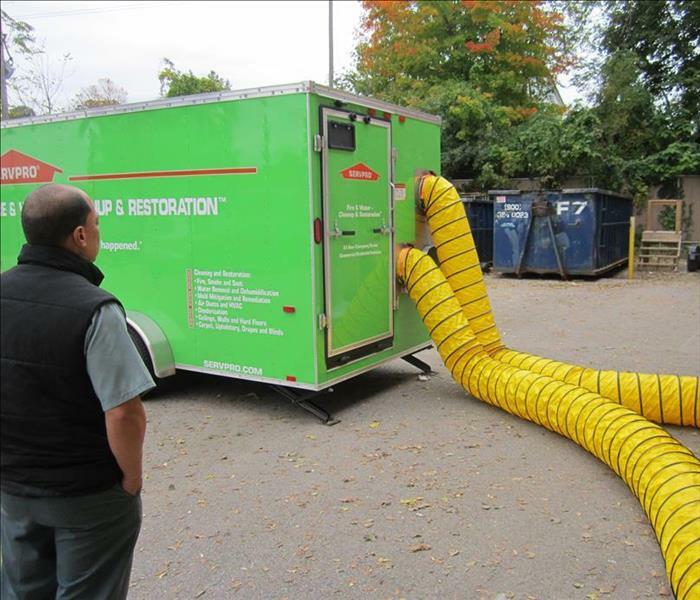 The certified water remediation experts at SERVPRO of Newton / Wellesley have access to state-of-the-art, commercial grade pumps, truck mounts, dehumidifiers, and air movers. We understand that there is never a convenient time for damage to strike your commercial property and that every hour a space is unusable is an hour of lost productivity and revenue. That is why SERVPRO of Newton / Wellesley technicians are on call 24 hours a day, to make sure you are back to business as soon as possible. The sump pump in the basement of this Hopkinton home failed during a recent rain storm. The entire basement; playroom, storage area and utility room, flooded with 2 inches of ground water. When that happens, pumping the water back outside is an exercise in futility. The water will simply find its way back into the basement! 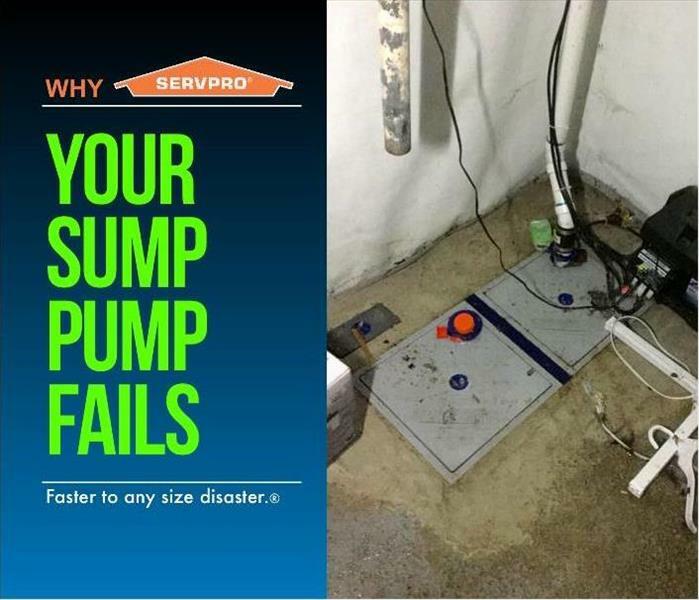 With the combination of our commercial grade water extraction equipment and truck mount tank systems SERVPRO of Newton / Wellesley technicians can remove thousands of gallons of water from your basement and off of your property faster than the other guys. Doing so will significantly reduce the amount of damage to your home and prevent secondary water damage (mold) from occurring! 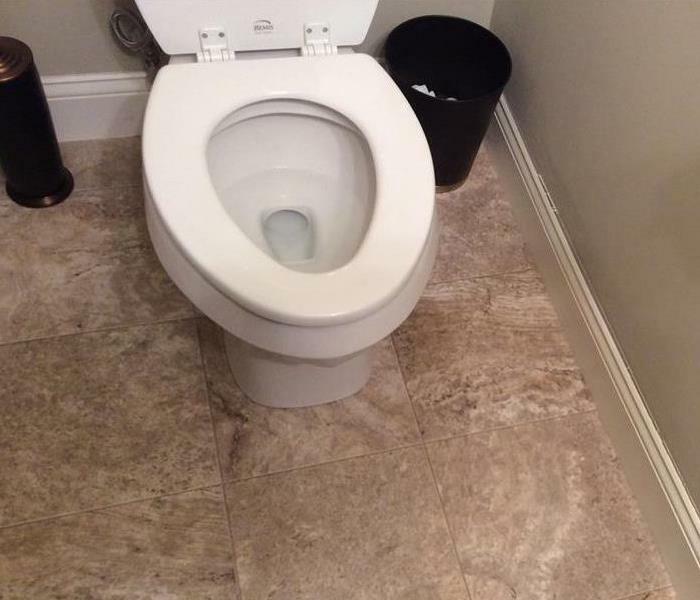 When the restrooms in your commercial property flood you need immediate results! 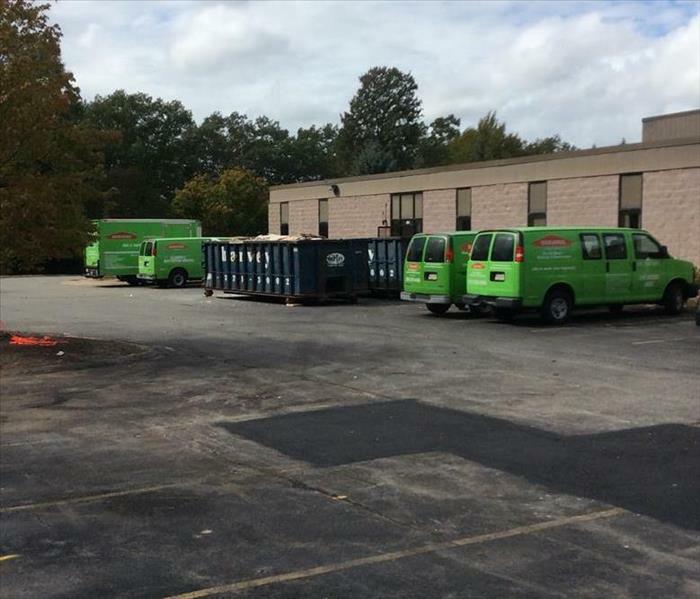 From removal of hazardous waste to sanitation of the job site SERVPRO of Newton / Wellesley is your one stop-24 hour-shop to remediate any disaster. We will get you back-to-business faster than the competition! Has a large loss struck your commercial property? Does remediation exceed internal resource capabilities? Call the Disaster Recovery Team at SERVPRO of Newton / Wellesley. Our one-stop, remediation to rebuild shop make it "Like it never even happened." any time, every day. From equipment to technicians we have all the resources you need under one roof! When disaster strikes you want a company that will make it "Like it never even happened." 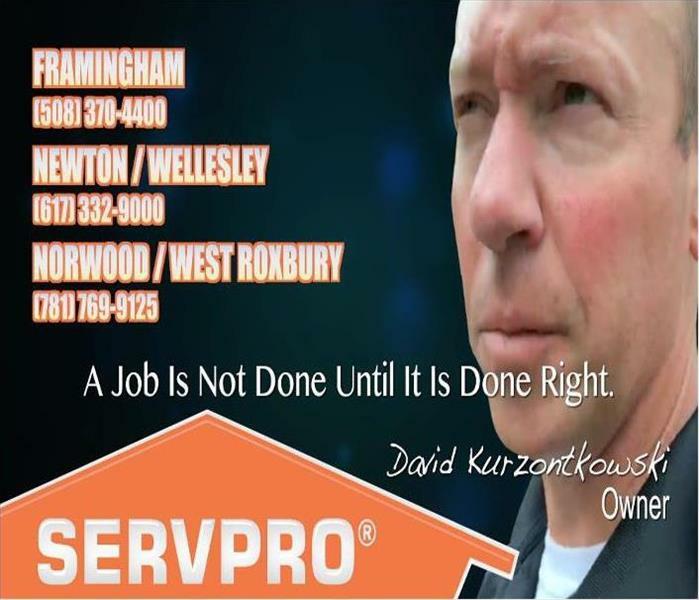 At SERVPRO of Newton / Wellesley a job is not done until it is done right! Heat lamps may keep chickens and hens safe and warm, but tragically this one caught fire in this home outside of Boston, Massachusetts. Immediate action is crucial when dealing with water and fire damage. 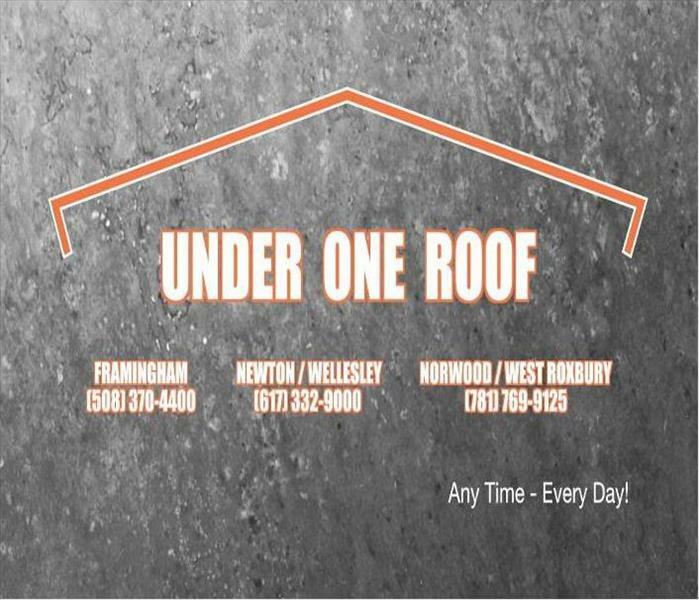 SERVPRO of Newtown / Wellesley is dedicated to responding immediately when you need help. A fast response helps lessen the damage, limits secondary damage, as well as reduces cost. A home in Newton experienced a sudden pipe burst flooding their basement. SERVPRO of Netown /Wellesley arrived shortly there after and immediately began remediating the situation. Our advanced equipment helps to detect hidden moisture, extract the standing water quickly, and thoroughly clean and dry your home and belongings. We finish the job with professional deodorization and sanitizing agents for your comfort and safety. Owners of this beautiful Weston home were just devastated upon returning from their trip only to find several pipes have burst. In addition the water had been running only to be discovered days latef. The arctic cold spell was to blame with temperatures below zero lasting for a couple of days. Picture shown here is water springing from the pipes in their heated! garage. This beautiful older home in Newton Center experienced a sewage pipe leak in their partially finished basement. The water seeped into tiny crevices of the basement including the utility sink. SERVPRO of Newton / Wellesley brought in several dehumidifiers to remove the water and humidity and shortly thereafter they remediated the mold damage. 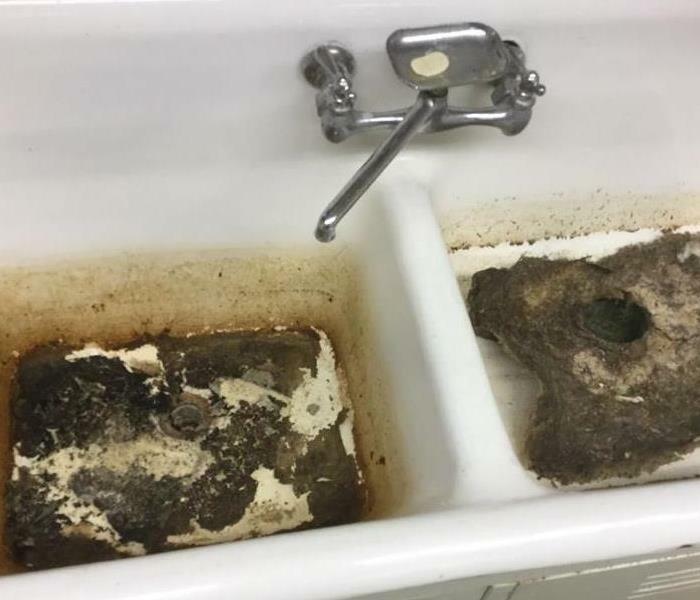 Shown in this picture is the mold residue left on the sink before SERVPRO used their specialized equipment to remove the mold from basement. New England rang in the New Year with an unusually long cold spell. The below freezing temps devastated many properties including this apartment building in Boston. This older brownstone had significant water damage as many pipes burst throughout several units. Hardwood, sheetrock, ceilings and basement needed remediation and tenants went days without hot water. SERVPRO of Newton/Wellseley was on the scene and began renovations immediately. Luckily no one was hurt in this devastating fire. A wood burning stove caught fire causing considerable damage. With oil and gas prices soaring, more Americans are using wood-burning stoves to heat their homes — but owners can be in big trouble if they aren't careful. Starting with picking out the right kind of wood. Safer woods include oak, hickory and ash. Avoid burning pine and cedar. 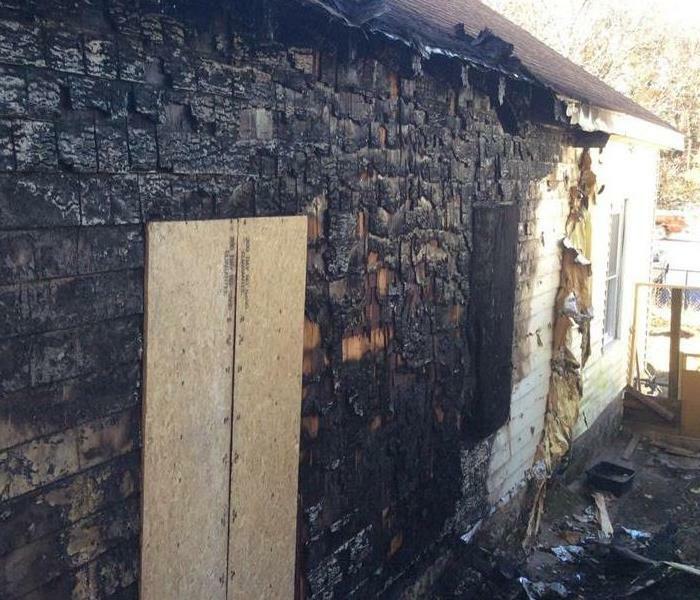 But any wood can create dangerous sparks, like those that caused the flames in this home. A small kitchen fire created a lot of soot and smoke damage affecting every room in the home. Every fire damage situation is a little different and requires a unique solution, but the general process stays the same. When various materials burn, the soot they create differs greatly and requires a specific cleaning procedure. A leak on the 4th floor of this beautiful historic Alumni building in Boston caused water damage to two floors. SERVPRO of Newton / Wellesley was quick to the scene to remediate the problem. We have the training, experience, and equipment to handle commercial flooding or water damage emergencies. Whether your water emergency occurs in a small office building or big box store, we will respond quickly to mitigate the damage and manage the restoration project through to its completion. A commercial property owner reached out to SERVPRO of Newton / Wellesley as he need to prepare his retail / restaurant space for new occupants. When grime, odor, and moisture challenges go beyond the scope of your regular janitorial staff, you should call us at 617-332-9000 for prompt and exceptional service. Where there's water and moisture, there is most likely mold. 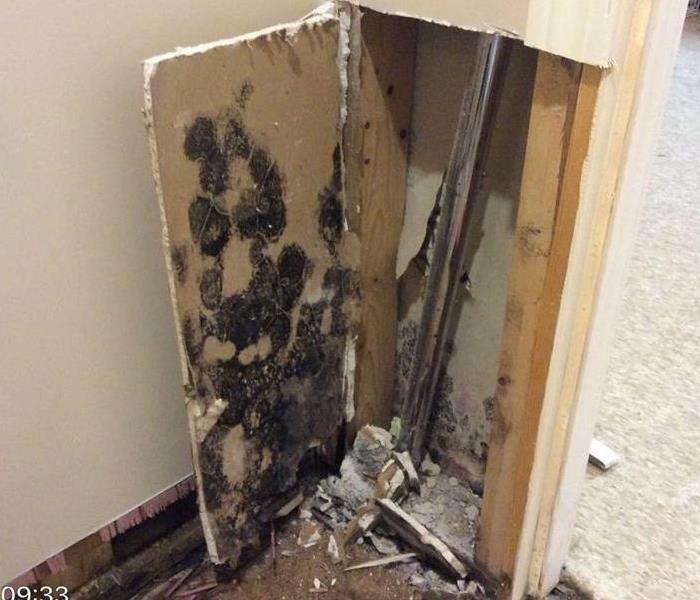 This homeowner suspected they had mold in their unfinished basement because of the humidity and dampness. Sure enough when we saw signs of mold we also discovered there was mold in the attic because dark damp places are the perfect breeding ground for micro-bacterial growth. On a hot summer day this customer noticed visible mold on their ceiling. It turns out they had an ice dam that previous winter that went unnoticed. However water was trapped in the roof, creating the perfect breading ground for mold. SERVPRO of Newton / Wellesley removed part of the ceiling and with our expertise we were able to remediate the mold infestation. Skylights often leak because their flashing is damaged, corroded or not properly installed. Though often times those "leaks" are the result of other problems that are not so obvious. 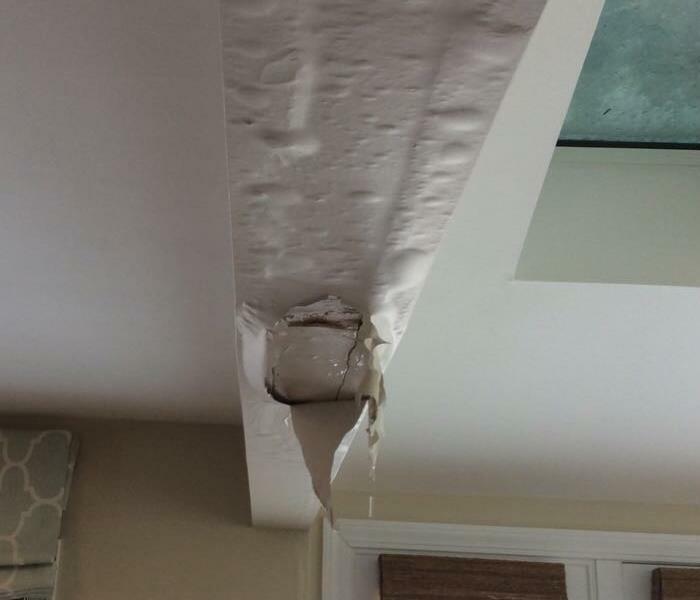 For example, water can get through the roofing upslope of a skylight and then leak out around the skylight's framing. That is what happened to their customer and we had to remove part of the ceiling due to the moisture and stains. Never neglect a running toilet because it can cost you plenty! A customer noticed their toilet had be running but it was just more a of nuisance. However the toilet was actually leaking water down below into the ceiling, their kitchen as well as kitchen cabinets. SERVPRO was immediately on the scene and contained and protected the cabinets that were not affected. Another pipe fell victim to New England inclement weather. 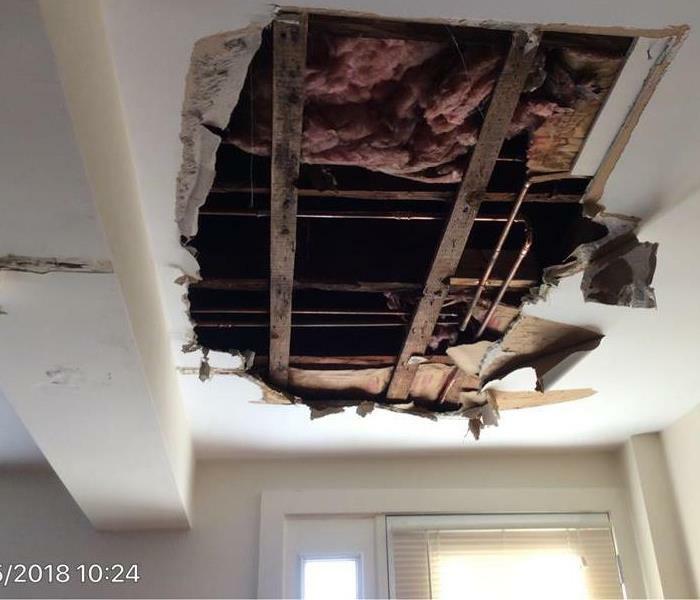 This pipe burst and flooded the living room of this Massachusetts home. 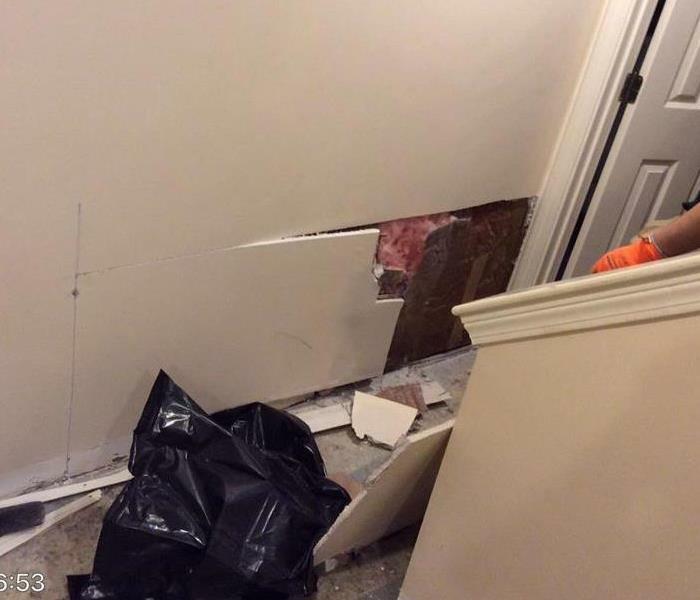 SERVPRO of Newton / Wellesley had to remove part of the damage wall so the interior could dry out using our specialized equipment. So whenever your home When your Newton home has water damage from flooding or leaks, we have the expertise and equipment to properly restore your property. 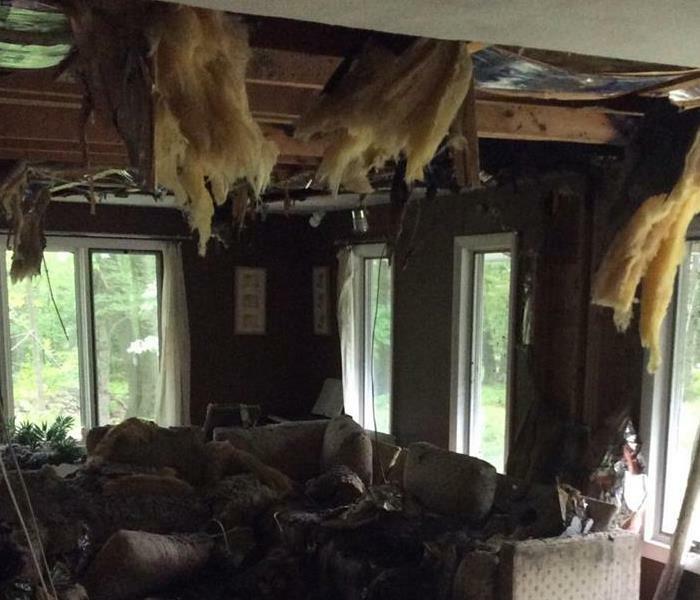 This home in was struck by lightning while the homeowner was away and fortunately no one was hurt. However the home received extensive damage and the house caught on fire due to this summer thunderstorm. SERVPRO of Newton / Wellesley responds immediately with our highly trained technicians who employ specialized equipment and techniques to restore your home back to pre-storm condition! A pipe burst on the first floor affecting the bedroom, living room, hallway and down to the finished basement. SERVPRO of Newton / Wellesley quickly dries your home using state-of-the-art water removal equipment and advanced drying techniques. We also document every step of the drying process to make sure your home is dry and the job is done right. This customer has had their fair share of run-ins with ice dams. They had an ice dam two years ago and had the roof repaired, unfortunately not well, as that did not solve the problem. The same dam occurred in the same spot this time affecting their upstairs bath, bedroom, and first floor bath and kitchen. The customer's pipe burst behind their kitchen sink and not only flooded the kitchen floor but also seeped into the finished basement below. SERVPRO of Newton / Wellesley was immediately on the scene with our advanced equipment and scientific drying techniques. In addition our Water Damage Restoration Technicians uses our special drying process to bring your home back to pre-storm condition. Skylights are notorious for causing rook leaks and dam no matter how many times you leak proof them using a flashing kit. When ice dams occur they are bound to cause much damage to your roof and home. As seen in this picture, you can see where the water began to pool, warping the paint and affecting the wood structure. A wave of arctic temps hit the New England area in February and we had a great deal of customers affected by their pipes bursting. The only difference was for the ones at home they were able to address the situation right away. As shown in this picture, the customers pipe burst under their kitchen sink and seeped into the basement affecting all dry boards. While the customer was away, a cold front was the culprit of several pipes bursting causing the furnace to malfunction, leak and subsequently the radiators leaked. In a charming 1920s, 2 story seven room home, sadly all seven rooms were affected. SERVPRO of Newton / Wellesly responded immediately to the customer's flood and storm damage emergency and brought this beautiful home back to pre-storm condition. This customer noticed mold on her finished basement walls as it is so common to discover mold in damp dank settings like basements. Once we opened up the walls as shown in pictures, it was a bigger job than owner initially realized. The mold even spread to underneath the stairs and SERVPRO of Newton / Wellesley remediated the situation right away! This cucustomer located mold located in their basement and if you look closely in this picture, you can see the mold on the refrigerator. Since mold can produce allergens and irritants, you should call SERVPRO of Newton / Wellelsy to inspect your home if you suspect you have a mold problem, before it grows out of control. This customer noticed visible mold in her bathroom and called SERVPRO of Newton / Wellesley right away. It is important to make sure bathrooms are properly ventilated particularly of those with baths and or showers because moisture creates the perfect breeding ground for mold. After a bath or shower make sure you run the fan for at least 20 minutes to adequately clear the humidity. This house fire is still under investigation but it is believed that the homeowners beloved pet cat accidentally knocked over a lamp causing pervasive damage. Over 50% of the home is considered a loss due to fire and water for trying to contain the fire. In just a few minutes devastation can occur and you should always be prepared to know who to call if the unfortunate situation ever happens to you. Chimney Fire Reminds Us the Importance of a Good Chimney Sweep! So many of us homeowners depend on fireplaces, wood stoves and other fossil-fuel heating appliances to heat their home but neglect chimney and furnace cleaning. Creosote is a flammable material that causes chimney fires, which as shown in this picture causes devastating fires. SERVPRO of Newton / Wellesley have the specialized fire and water damage restoration training, personnel, and equipment to handle fire and water damage and can quickly restore your home to pre-fire condition. A house fire that initially started in the attic caused considerably damage to this home and fast. Thankfully no one got hurt but the fire did leave its mark, reminding how destructive and devastating fires can be. SERVPRO of Newton / Wellesley has the water and fire damage training and expertise to help you through this tough time. This office's HVAC system leaked causing water damage to the floorboards, walls and carpeting. As shown in the picture, our crew member is protecting the furniture before we begin a remediation process. . You need a company that can minimize the disruption to your clients while delivering superior results. 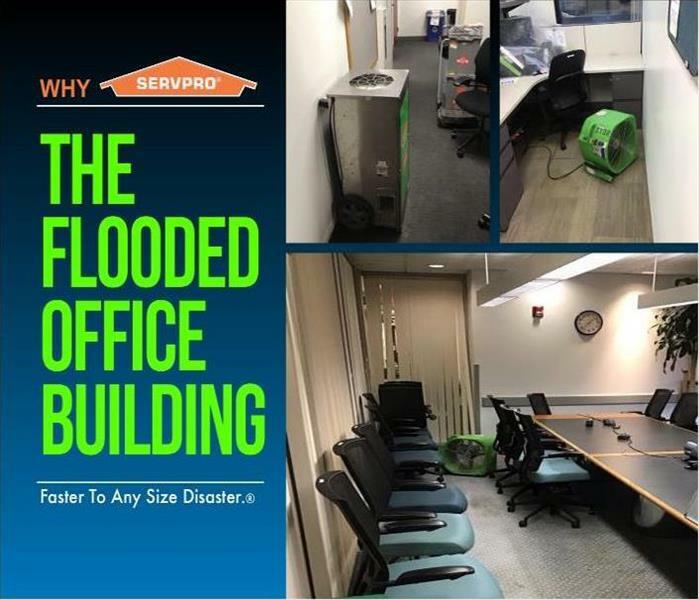 Whether you need professional cleaning to make your business shine, or emergency water restoration services, SERVPRO of Newton / Wellesley has the training and expertise to help. It's an important reminder to always make sure computers are off the floor or raised by 3 inches. This office experienced water damage affecting the walls and carpeting but also more importantly their computer systems. You can count on SERVPRO of Newton / Wellesley to respond promptly and make your workspace look its very best. This is water happens when someone accidentally leaves a garden hose on that leads into the basement. A beautiful New England church experienced extensive water damage with approximately one inch of standing water in three rooms including the auditorium including the beautiful hardwood floors. Luckily with SERVPRO of Newton / Wellesley 24 hour service, we were immediately on the scene. A neglected water issue turns into a large mold remediation project. This portion of the building had gone unoccupied and the new property managers discovered they needed the SERVPRO professionals to contain and safely remove the mold. SERVPRO of Newton / Wellesley have the training, equipment, and expertise to handle the situation! When it comes to your commercial property, we mean business. You need a company that can minimize the disruption to your clients while delivering superior results. Our heat trailer was on site of a commercial loss in Newton, MA. This unit helps the expediate the drying process. Every day we make disasters "Like it never even happened." This was the aftermath of a kitchen fire in Newton, MA. We immediately arrived on the scene and witnessed the significant smoke and soot damage that was able to reach every far corner of the condo. The owner of the condo could not believe how quickly we were able to clean the soot from the walls and ceiling. During an extremely cold night a sprinkler head burst causing quite a bit of damage to a hotel lobby and surrounding offices. We arrived soon after to assist and the facilities engineer was quite satisfied with the results. We specialize in water damage restoration, as that is the cornerstone of our business! Our job is not only to service your disaster, but, also to keep other parts of your home safe and clean while we are working in the affected area. Putting up containment helps keep the rest of your home dust free. Our residential cleaning services performed by our SERVPRO Newton / Wellesley professionals will not only ease the burden of the constant maintenance of your home, but will also create a safe, clean and comfortable living environment for you and your family.